This week David Irving, the discredited British historian who was described by a high court judge [seven years ago] as a Holocaust denier and a racist, says he is launching a comeback with a speaking tour of British cities and a series of new books. "I have kept a low profile for several months because I have had to sort out where to live and to address my financial situation," said Mr Irving, who was declared bankrupt in 2002 after an unsuccessful libel action over claims he was a Holocaust denier. But now I am ready to start again." Mr Irving's career has been littered with controversy, culminating with his arrest in Austria in 2005. He was sentenced to three years in jail after a judge ruled that two speeches he made in 1989, dismissing the Auschwitz gas chambers as a "fairy tale" and questioning the existence of extermination camps, breached Austrian law. His appeal [on December 20, 2006] was upheld, with the judge saying the crimes were a long time ago and that Mr Irving had undergone an "impeccable conversion". However, drinking tea on the sofa of a 10-bedroom house he has begun renting near Windsor, Mr Irving says that his views on the Holocaust have crystallised rather than changed. He says that he believes the Jews were responsible for what happened to them during the second world war and that the "Jewish problem" was responsible for nearly all the wars of the past 100 years: "The Jews are the architects of their own misfortune, but that is the short version A-Z. Between A-Z there are then 24 other characters in intervening steps." Mr Irving was due to address a meeting in Coventry last Friday - although that event was disrupted by protesters - and held another meeting at his home on Saturday (left). He plans to speak in Halifax and Birmingham as well as at several unnamed universities. 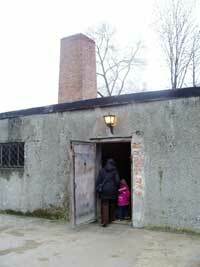 The crematorium at Auschwitz I, "rebuilt" as a fake gas chamber in 1948: the chimney is not even connected to the building, there are no blue cyanide stains, and the doors don't fit. Last night, news of his attempts to kickstart his career were met with disbelief and anger from Jewish groups and political opponents. Lord Foulkes, of the Labour Friends of Israel, said: "It is a frightening thought that he is still pursuing his agenda." Jon Benjamin, chief executive of the Board of Deputies, said Mr Irving no longer had any legitimate claim to be a serious historian. However, Mr Irving still insists he is a respected academic. 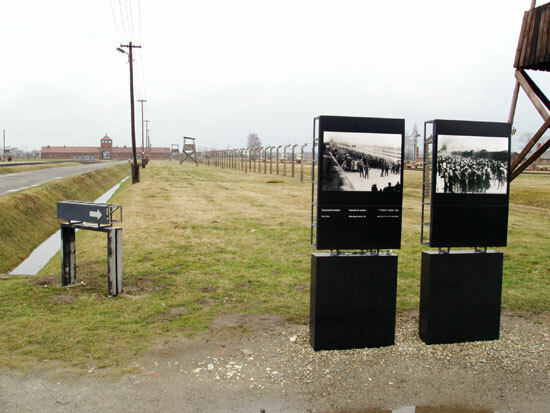 He says that a document, which he is 80% sure is genuine, suggests that 2.4 million Jews were killed in Poland, but goes on to claim that the gas chamber at Auschwitz was fake [see panel at right]. "It was not the centre of the killing operations - it has only become a focus because it is the site that is best preserved. 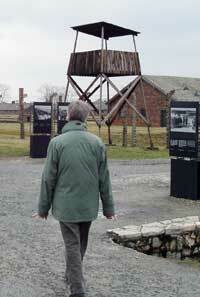 Much of what is shown the tourists there is faked postwar - watchtowers, even the famous gas chamber." He added: "In my opinion now the real killing operations took place at the Reinhardt camps west of the Bug river. In the three camps here [Sobibór, Belzec, and Treblinka] Heinrich Himmler's men (mostly Ukrainian mercenaries) killed possibly as many as 2.4 million in the two years up to October 1943. There is now nothing to be seen of the Reinhardt camps, neither stick nor stone, so few tourists go there. I have visited all four sites earlier this year."